For hundreds of years Point Dume was a sacred site for the Chumash people. Even today, with sedate, 1950s ranch-style houses rapidly giving way to post-modern mega-mansions on almost every lot, this is still a landscape scattered with the broken fragments of ancient lives. This is one of the earliest photos of Point Dume on record, dated 1898, and shot when the Rindge family still owned the entire 13,3000-acre Malibu Rancho. The photo was taken on the bluff overlooking Big Dume Cove, also known as Pirate's Cove, and it documents the unaltered, unflattened top of the hill on the Point. Gophers, construction workers, and gardeners excavate Chumash “ecofacts,” bits of seashell and bone, and chips and flakes from tool making, all the time. Sometimes more substantial artifacts turn up—shell beads, stone tools, mortars, metatas, pestles, fishing hooks. On the portion of the Point Dume Headlands that is now a State Park, the remains of shell middens and tool fragments are everywhere. One Point Dume neighbor who lived here in the 1950s and is now dead, recounted unearthing Chumash baskets in the gully behind his house; another neighbor found a perfect stone knife, its artfully chipped edge still razor-sharp. Many locals have a shoebox or curio cabinet full of artifacts. Because the Malibu Rancho remained intact and off limits until the 1920s, Chumash sites in the area remained relatively undisturbed well into the 20th century. In the 1940s, Point Dume was parceled out and sold for development. It also became fair game for pothunters, who sold their finds to collectors eager to own artifacts and not particular about where they came from or how they were acquired. Some enterprising treasure hunters reportedly manufactured new artifacts when they ran out of authentic finds. E.K. Burnett wrote a monograph on Chumash archeological finds in 1944. 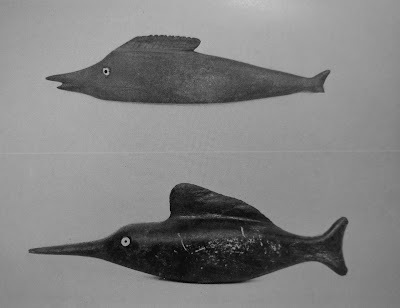 “Inlaid Stone and Bone Artifacts from Southern California,” published by the Museum of the American Indian, Heye Foundation, provides photos of spectacular artifacts excavated on Point Dume by a man named A. Sanger and his associates. Burnett gives one of the only existing descriptions of the site before development radically changed the landscape, but it’s maddeningly vague, and there is no way of knowing where the artifacts he catalogued ended up, or if they were even genuine. Sanger, an “amateur archeologist” remains at the center of a 60-year-old controversy involving accusations of fraud and forgery. 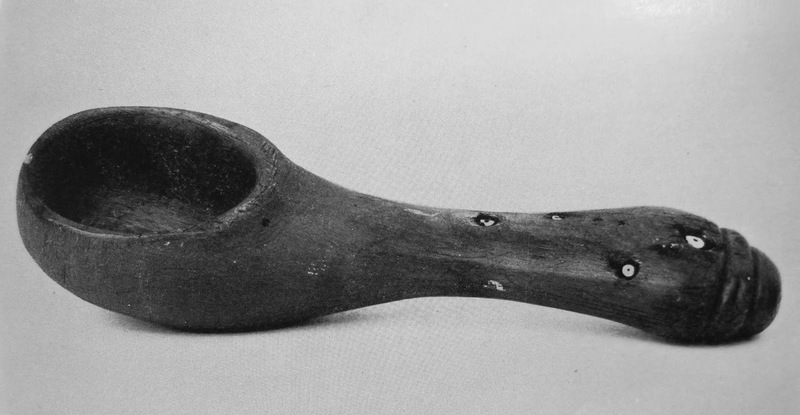 A purported Chumash artifact allegedly found on top of the Point in the 1940s. It may or may not be authentic. Any genuine remnants of what has been described as a Chumash sun shrine have probably been completely erased by pothunters, bulldozers and the presence of the U.S. Army during WW II. 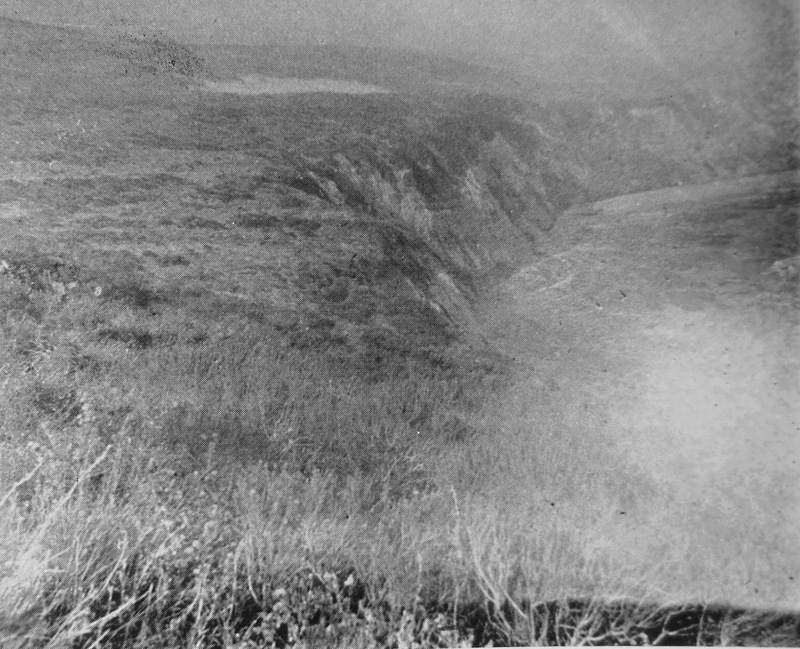 “The Coastal sites are all located near the cliff edge and, except for those on Point Dume, are located at one side of an arroyo mouth,” Burnett wrote, but he did not appear to have first hand knowledge and the monograph provides few details about the actual sites, other than a couple of blurry photos. According to State Parks documents, “The Chumash lived at Point Dume around A.D. 1080 – A.D. 1200, based on information recovered from archaeological testing at the site." However, archeologist Gary Stickel makes the case that an archeological find made in 2007 at a site less than two miles from the Point Dume Headlands, pushes the occupation date for the area back 11,000 years. The find, described as a Clovis projectile point, was turned up by a backhoe during construction of a residence. The projectile point is, so far, the only one of its kind found in the vicinity. More artifacts allegedly removed from Point Dume in the 1940s. These resemble authenticated carvings and may be genuine. The portion of the Point described by Burnett in 1944 as "the principal [site that] covers about three acres at the base of the hilly eminence and eastward along the bluff. The photo and the description match the current site of extensive midden debris. The document concludes that “There are many significant archaeological sites in the vicinity of Point Dume. However, there is only one recorded site in the park: LAN-454.” This appears to be the site referenced by Burnett. The cup is an intriguing artifact and reportedly appears authentic. Burnett says it was made of steatite, and described it as 11 inches long and weighing over two pounds. He doesn’t provide descriptions of any other objects found in that location, and he doesn’t specify the date of the alleged find. At some point, the top of the hill was graded, and any Chumash cultural resources were destroyed. The exact year that the top of Point Dume was bulldozed flat remains a point of contention. Some historians say it happened during WW II to accommodate a military installation, others contend the bulldozing was a prelude to the building boom of the late 1940s. The site that eluded Burnett is now the location of the Point Dume Mobile Home Park. A street named “Indian Mound” on the west side of the development bears mute testimony to the location’s history. Skeletons and artifacts were allegedly swept away by construction crews in the early 1970s. before the era of cultural preservation. The date when the top of the Point was bulldozed remains a contentious point with local historians, but this detail of a 1939 aerial photograph appears to verify that the top of the Point had already been flattened before the military arrived in the 1940s. I was surprised to see how much vegetation is visible. I grew up hearing how the Point was a desolate, windswept mesa, before the windbreaks of eucalyptus trees were planted in the 1940s. In reality, there ought to have been California black walnut trees and toyons in the canyons, and there are still lemonade berry shrubs and Mexican elderberry trees. 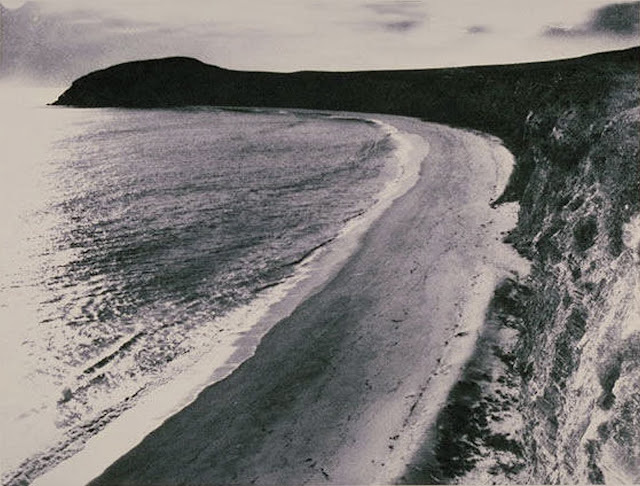 Point Dume in 1947. Only a few houses were already built, but roads show where development was planned. That's Little Dume Cove, with Grayfox Street on one side and the Wildlife/White Sands Circle just visible on the far right side of the image. I scanned this photo, and the one above, are available online in in their entirety at the Adamson House Archive. The bones of the dead and the artifacts that accompanied them are not the only elements of Chumash heritage that have been swept from the Point. While British explorer George Vancouver is credited with naming Point Dume for Father Francisco Dumetz, whom he visited at Mission San Buenaventura shortly before he named the peninsula in 1793, there is evidence to suggest the word "Dume" stems from the same root as Zuma—the Chumash word "Sumo," which reportedly means abundance. Vancouver named Point Mugu for the Chumash community of Muwu shortly before assigning the name “Dume,” to the eastern point. "This Point I will call 'Point Dume,'" he wrote. The word is clearly “Dume,” and not "Dumetz." Frederick Hastings Rindge, who purchased the entire 13,300-acre Malibu Rancho in 1892, called the point "Duma," and stated the name was derived from Zuma. His view may be supported by information provided by the same Chumash informant, Fernando Librado, who described Point Dume as a sun shrine. Librado told ethnographer John Peabody Harrington in a conversation recorded in Harrington’s notes from 1912-15 that "Sumo extends out to sea and at the end of the point there was a hill." Librado added that "Sumo is called in nautical language Dume." Regardless of how, or for whom, it was named, Point Dume was significant to the Chumash people. The Coast Guard practice repelling invaders. A barracks on what is now Wildlife Road provided accommodations for the crew stationed at the Army lookout on the Point. The Coast Guard operated out of the Adamson House and had seven patrol stations at strategic intervals along the coast from Point Mugu to Malibu Creek. It was reportedly lonely work patrolling 27 miles of empty beaches, but a number of service personnel were so struck with the beauty of the place that they returned after the war and built some of the first homes on Point Dume. In the 1940s, with fears of a Japanese invasion escalating, it become important to the U.S. Government. The Army and Coast Guard used it much as the ancient Chumash before them, as a lookout. It was also one of three coastal U.S. Army anti-aircraft artillery training centers in Southern California during the war. 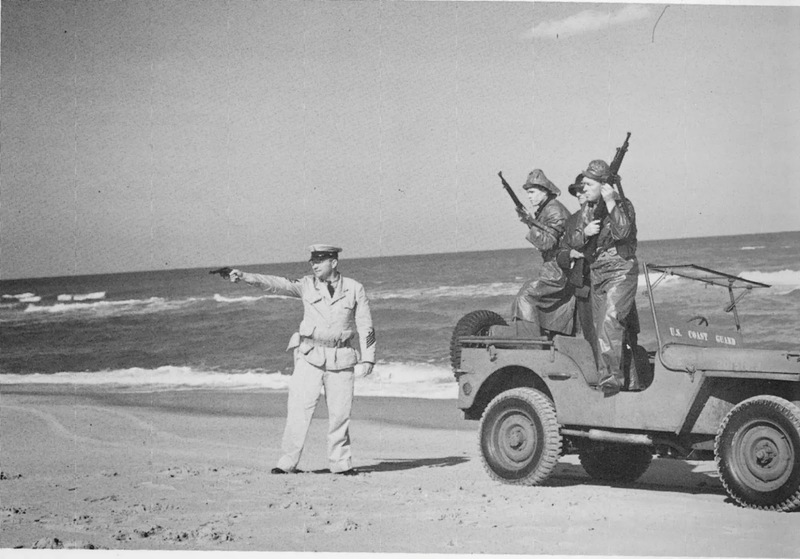 Military personnel were stationed along the Malibu coast from Point Mugu to Pacific Palisades for the duration of the war, but Point Dume reportedly offered the best visibility. For this reason it was on the list of proposed Nike missile sites during the Cold War. WW II artillery shells have allegedly turned up on the beach from time to time. There was a serious scare in 1952, when an unexploded mine or depth charge washed up on the beach, according to newspaper reports. 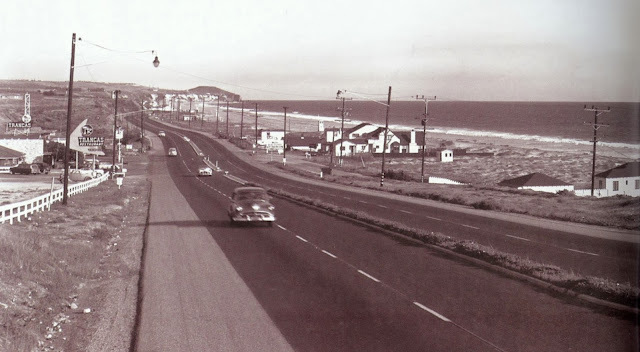 Post World War II PCH, with Trancas and Broad Beach in the foreground, and Zuma and Point Dume in the Background. Mandatory curfew and nightly blackouts, and gas and tire rationing effectively curtailed development in western Malibu until after the war ended. For people like John Guldimann, my father, who fought for years to save the Point Dume headlands from development, this sign is an affirmation that not all causes are lost causes. After the war, the development of Point Dume went into high gear. Roads were built, and houses started going up, closing in on the headlands from both sides. The Point was purchased by the RECO Land Company, owned by a man named Roy Crummer, who purchased large swathes of Malibu in the 1950s. Crummer was the largest commercial developer in Malibu during the 60s and 70s, and 80s, and perpetually at odds with early conservation activists. The only reason the Point Dume Headlands and the Point itself aren’t paved under a hotel and parking lot is because my father, John Guldimann fought for years in the 1970s to save the area. We have boxes of papers in the garage chronicling the fight. Dad flew to Sacramento to lobby for a Point Dume Preserve—a major undertaking in the 1970s. Some of my earliest memories are of the living room packed with people. Folksinger activist Peter Yarrow joined the fight. So did California State Assemblymember Paul Priolo. In 1979, 34-acres, including the remaining Chumash shrine site and the distinctive, flat-topped volcanic peak, were acquired by State Parks. In 1992, the property was upgraded to State Preserve. Many things have changed in Malibu since the time when the Chumash lived here, but from the top of the Point, looking out across the open ocean, or up the coast the Sequit Point in the distance, the view looks much as it must have to the ancient Chumash. 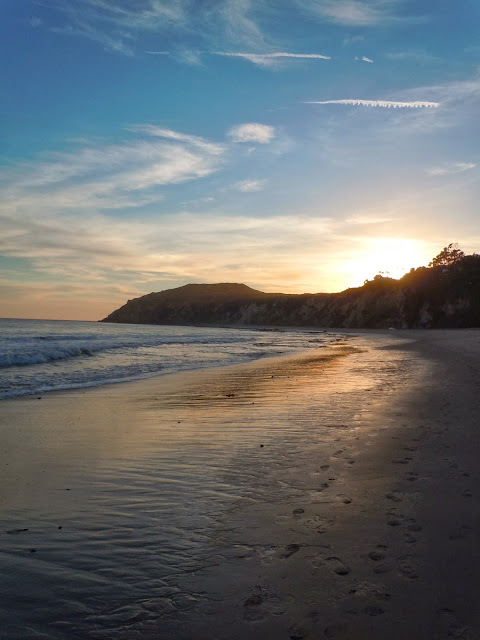 People come here to watch for whales in winter, or to see the sunrise and the sunset, much as the Chumash did. Much of Point Dume's cultural heritage is lost, but thanks to a lot of unsung heroes, including my Dad, the headlands' rugged beauty remains, and the Point will continue to be preserved and protected for future generations. Thanks, Beachgal! I remember Bonnie Raitt playing there when I was a kid. They had some amazing live music during the 70s and 80s. The thing that amazes me about that photo is how much sand there was in the 40s. It really was a broad beach back then. "Life in Malibu" is now available at Amazon. Suzanne Guldimann is a writer, an artist, and a lifelong Malibu resident. The photo at the top of the page shows the gate posts of the eastern entrance to Rancho Topanga Malibu Sequit, circa. 1900. Malibu was still an outpost of the wild west in those days, a 27-mile expanse of unspoiled, unoccupied, undiscovered country. It isn't any of those things any more, but it's still beautiful and surprising. In this blog I'll explore some of the everyday and extraordinary aspects of life in Malibu, a place that Frederick Hastings Rindge, the last man to own the entire Malibu Rancho, described as "very near terrestrial paradise." Please join me on the journey. Subscribe to the Malibu Post! Submit Your Email and Automatically Receive Every New Article. Copyright Suzanne Guldimann 2013-2016, The Malibu Post. All rights reserved. Simple theme. Theme images by Airyelf. Powered by Blogger.